The extent to which the measured (and felt) psychostimulant effects of caffeine represent a real benefit of caffeine consumption or merely withdrawal reversal is unclear. Results showing positive psychostimulant effects of acute caffeine administration in habitual non-consumers of caffeine would provide evidence for a net benefit of caffeine unconfounded by withdrawal. To compare the mood, alerting, psychomotor and reinforcing effects of caffeine in caffeine non-consumers and acutely (overnight) withdrawn caffeine consumers. In experiment 1, these participants consumed two differently flavoured dinks, one containing 100 mg caffeine and the other containing no caffeine. Each drink was consumed on 4 separate days in semi-random order, and self-ratings of mood and alertness were completed before and after drink consumption. On day 9, both drinks contained 50 mg caffeine and drink preference (choice) and intake were assessed. 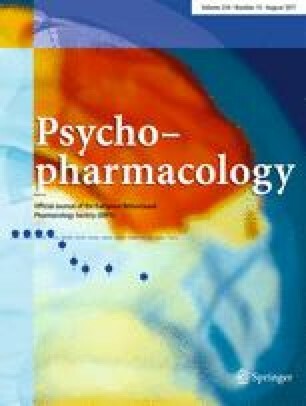 In experiment 2, mood, alertness and performance on a long-duration simple reaction time task were assessed before and after administration of 100 mg or placebo in a single test session. Prior to receiving caffeine, the (overnight withdrawn) caffeine consumers were less alert and more tense than the non-consumers. Caffeine only had significant reinforcing, mood and psychomotor performance effects in the caffeine consumers. The reinforcing effect of caffeine was evident from an effect on drink intake, but drink choice was unaffected. Caffeine increased self-rated alertness of both caffeine consumers and non-consumers; however, for some of the non-consumers this was associated with a worsening of performance. These results support the hypothesis that the psychostimulant and related effects of caffeine are due largely to withdrawal reversal.